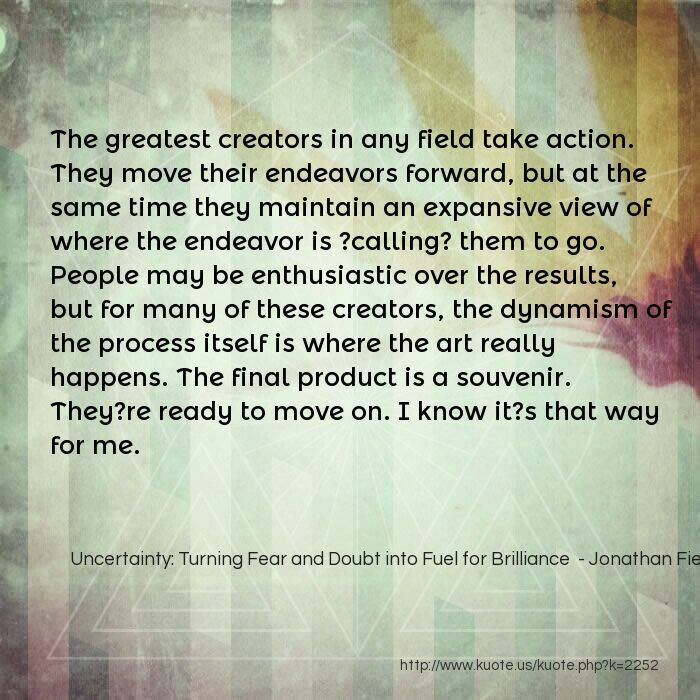 The greatest creators in any field take action. They move their endeavors forward, but at the same time they maintain an expansive view of where the endeavor is ?calling? them to go. People may be enthusiastic over the results, but for many of these creators, the dynamism of the process itself is where the art really happens. The final product is a souvenir. They?re ready to move on. I know it?s that way for me. 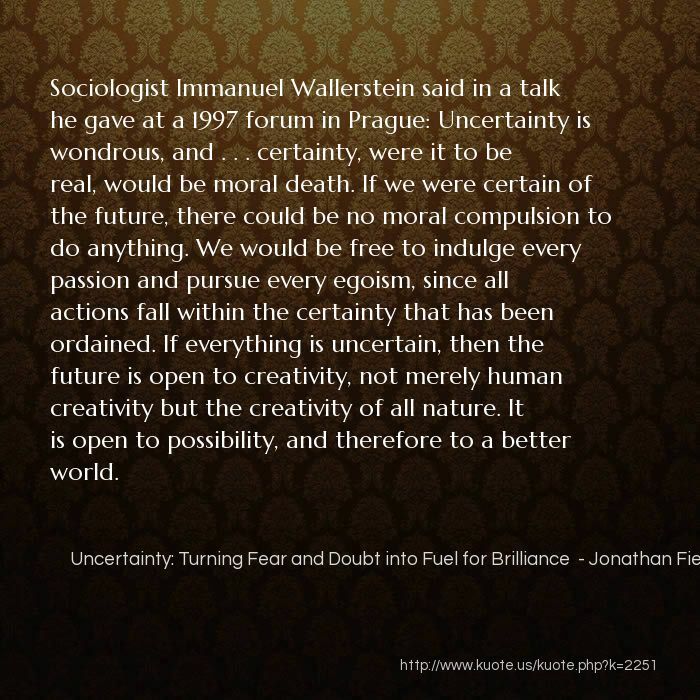 Sociologist Immanuel Wallerstein said in a talk he gave at a 1997 forum in Prague: Uncertainty is wondrous, and . . . certainty, were it to be real, would be moral death. If we were certain of the future, there could be no moral compulsion to do anything. We would be free to indulge every passion and pursue every egoism, since all actions fall within the certainty that has been ordained. If everything is uncertain, then the future is open to creativity, not merely human creativity but the creativity of all nature. It is open to possibility, and therefore to a better world. in larger context of the creative life, each end signals a new beginning. 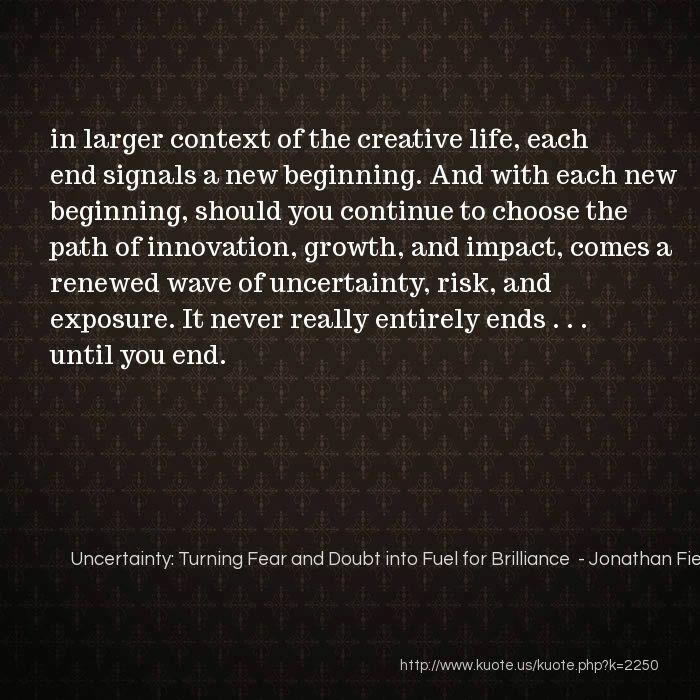 And with each new beginning, should you continue to choose the path of innovation, growth, and impact, comes a renewed wave of uncertainty, risk, and exposure. It never really entirely ends . . . until you end. Now revisit all three scenarios: your going-to-zero scenario, your do nothing scenario, and your success scenario. 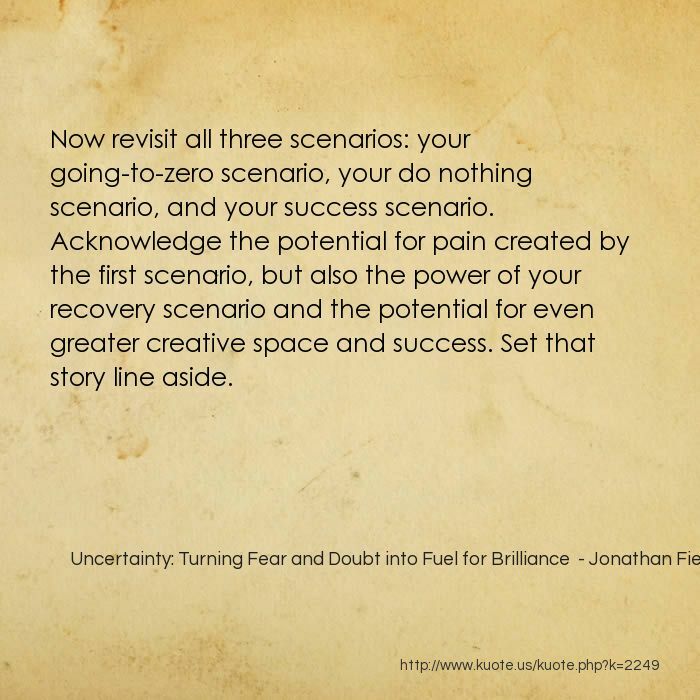 Acknowledge the potential for pain created by the first scenario, but also the power of your recovery scenario and the potential for even greater creative space and success. Set that story line aside. 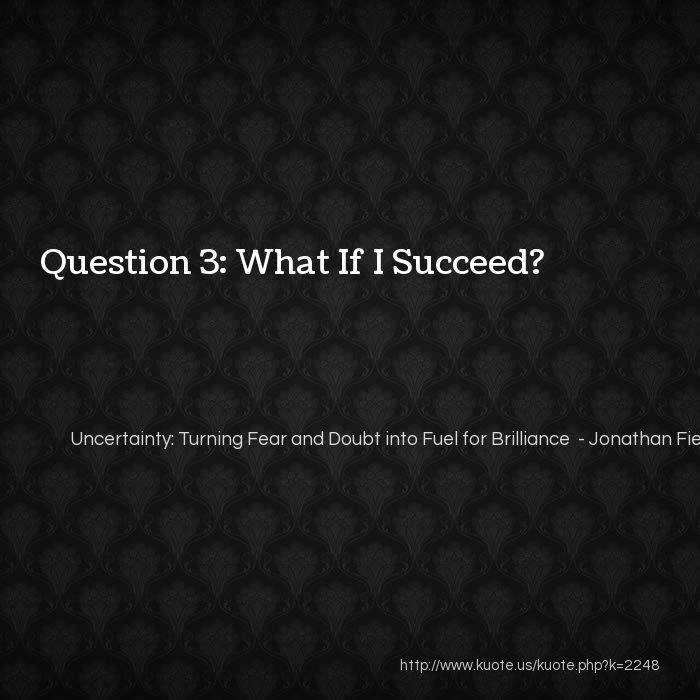 Question 3: What If I Succeed? 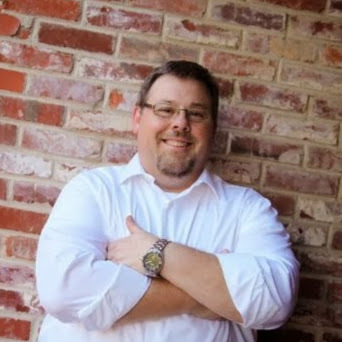 If you leave key parts of your life unaddressed over time, here?s what?s likely to happen: ? Nagging pain becomes chronic, acute, and debilitating. ? Unrewarding work becomes soulless, life-sucking agony. ? Passable health becomes obesity, disease, and, for many, early death. ? Relationships that are unattended to become estranged, angry, bitter, dysfunctional, and nonexistent. ? Your currently ?passable? 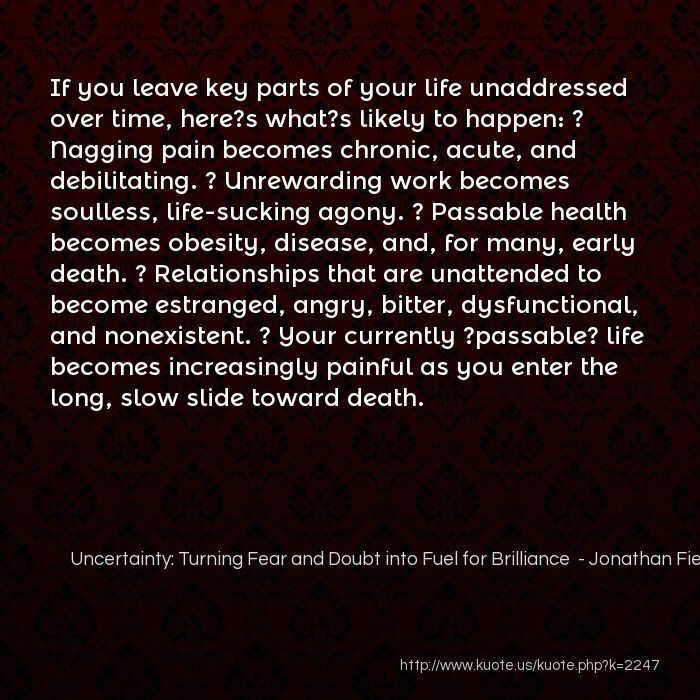 life becomes increasingly painful as you enter the long, slow slide toward death. 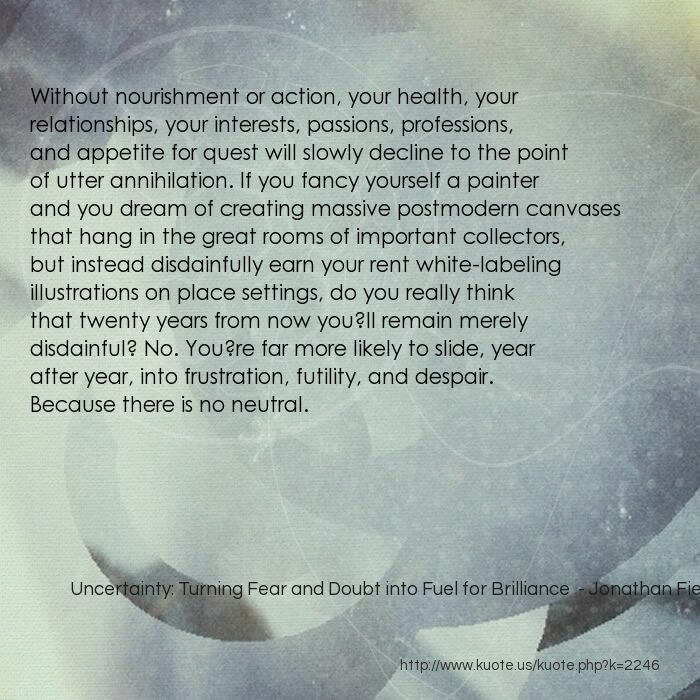 Without nourishment or action, your health, your relationships, your interests, passions, professions, and appetite for quest will slowly decline to the point of utter annihilation. If you fancy yourself a painter and you dream of creating massive postmodern canvases that hang in the great rooms of important collectors, but instead disdainfully earn your rent white-labeling illustrations on place settings, do you really think that twenty years from now you?ll remain merely disdainful? No. You?re far more likely to slide, year after year, into frustration, futility, and despair. Because there is no neutral. there is no sideways in life?not in relationships, not in business, not in spiritual growth, not in the quest to build something brilliant from nothing. There?s only up or down. 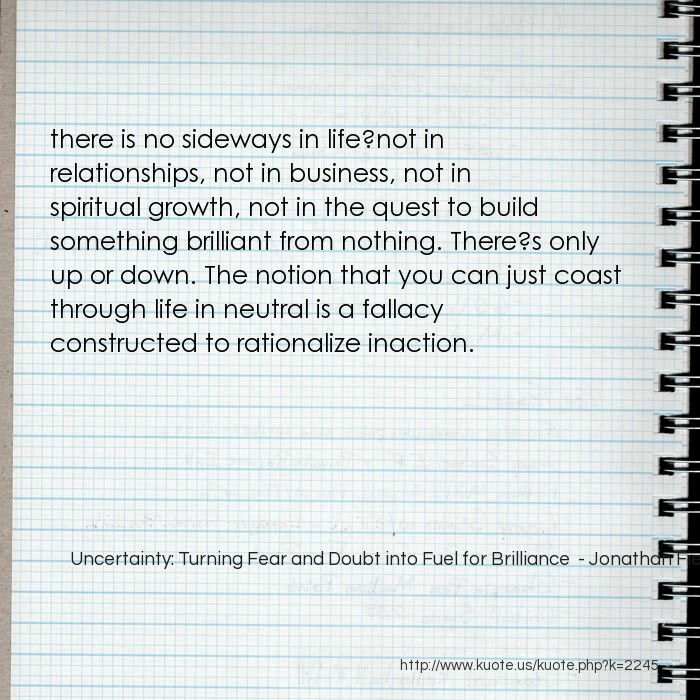 The notion that you can just coast through life in neutral is a fallacy constructed to rationalize inaction. 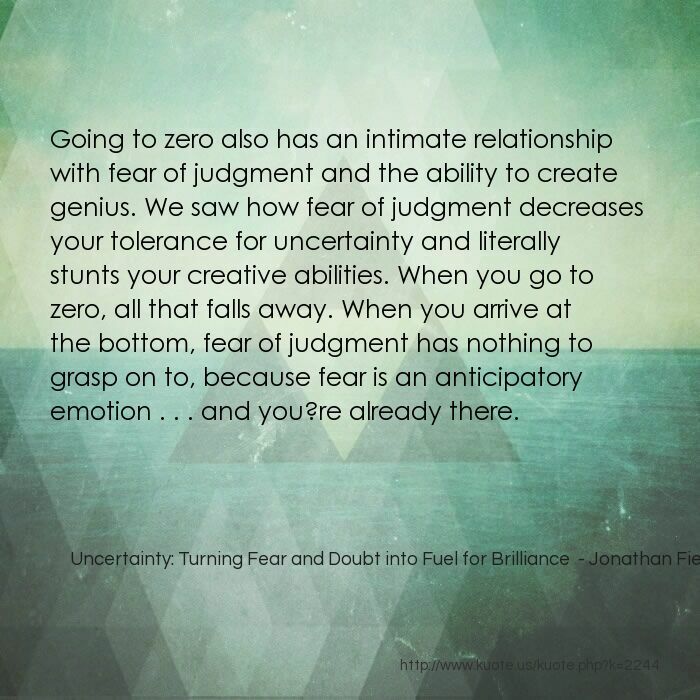 Going to zero also has an intimate relationship with fear of judgment and the ability to create genius. We saw how fear of judgment decreases your tolerance for uncertainty and literally stunts your creative abilities. When you go to zero, all that falls away. When you arrive at the bottom, fear of judgment has nothing to grasp on to, because fear is an anticipatory emotion . . . and you?re already there. 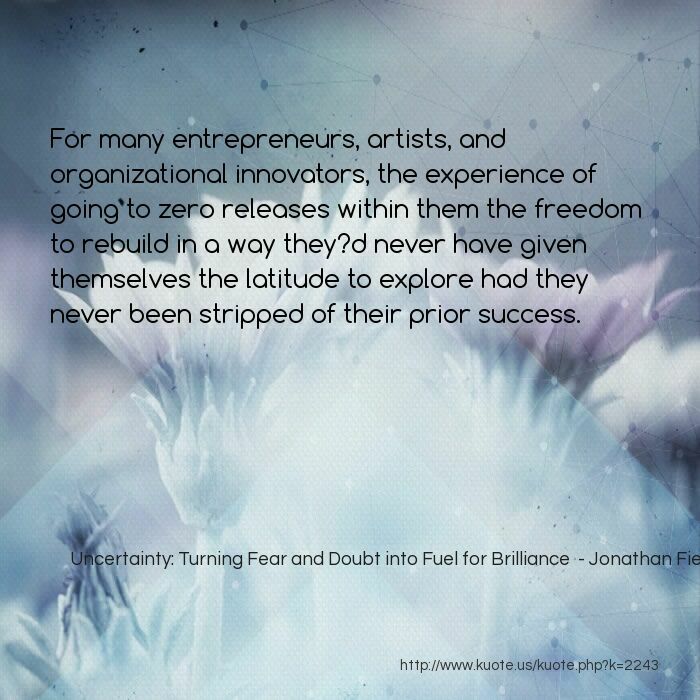 For many entrepreneurs, artists, and organizational innovators, the experience of going to zero releases within them the freedom to rebuild in a way they?d never have given themselves the latitude to explore had they never been stripped of their prior success. 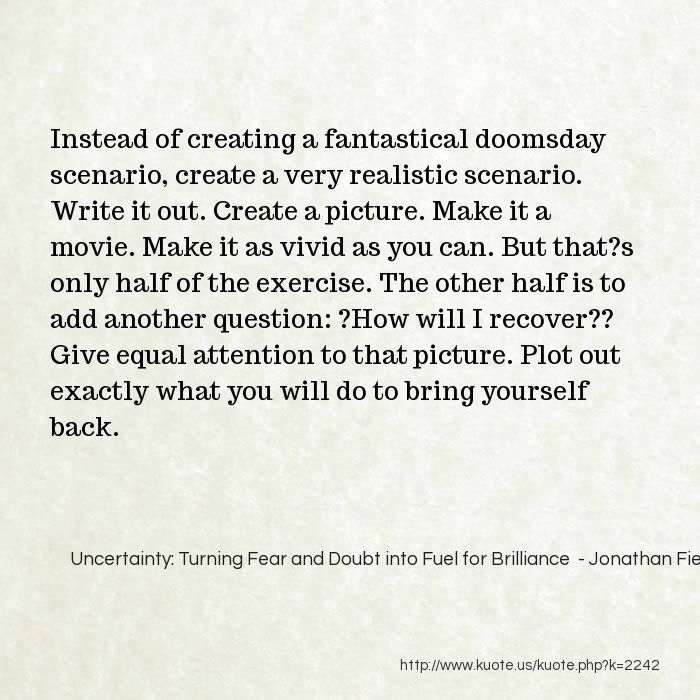 Instead of creating a fantastical doomsday scenario, create a very realistic scenario. Write it out. Create a picture. Make it a movie. Make it as vivid as you can. But that?s only half of the exercise. The other half is to add another question: ?How will I recover?? Give equal attention to that picture. Plot out exactly what you will do to bring yourself back. That alone is immensely destructive to your ability to create great work. But there?s another bit of fallout that?s even more insidious. 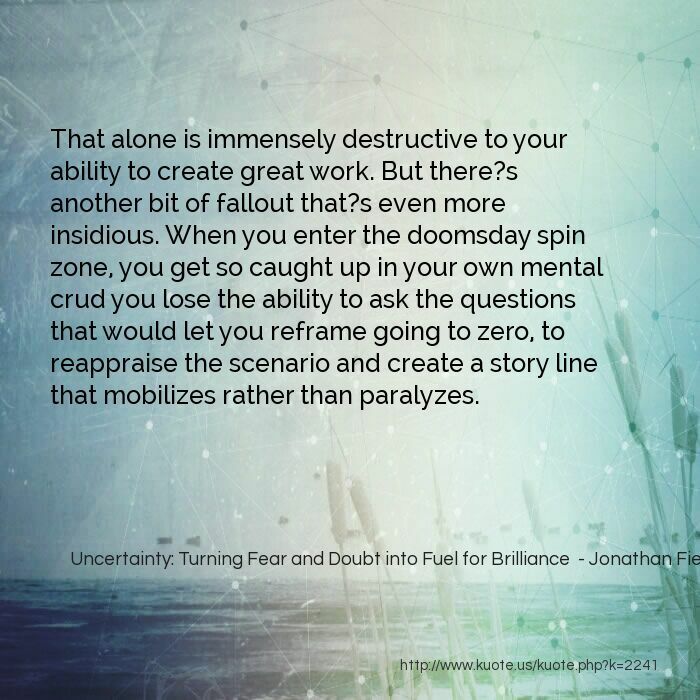 When you enter the doomsday spin zone, you get so caught up in your own mental crud you lose the ability to ask the questions that would let you reframe going to zero, to reappraise the scenario and create a story line that mobilizes rather than paralyzes. When we think about going to zero, instead of just creating a realistic scenario, saying, ?Okay, this is what happens and I?ll get through it,? we create a doomsday scenario. We start spinning in our heads: ?Oh, my God, if this thing collapses, I?m going to lose everything?my home, my relationships. I?m probably going to get thrown out of the country club. Everyone I?ve ever known since kindergarten will hate me. They?re going to take away all my possessions. I?ll have to eat fivefor-a-buck noodles and live on the street for the rest of my life. Everything I?ve worked to build will evaporate in a moment.? 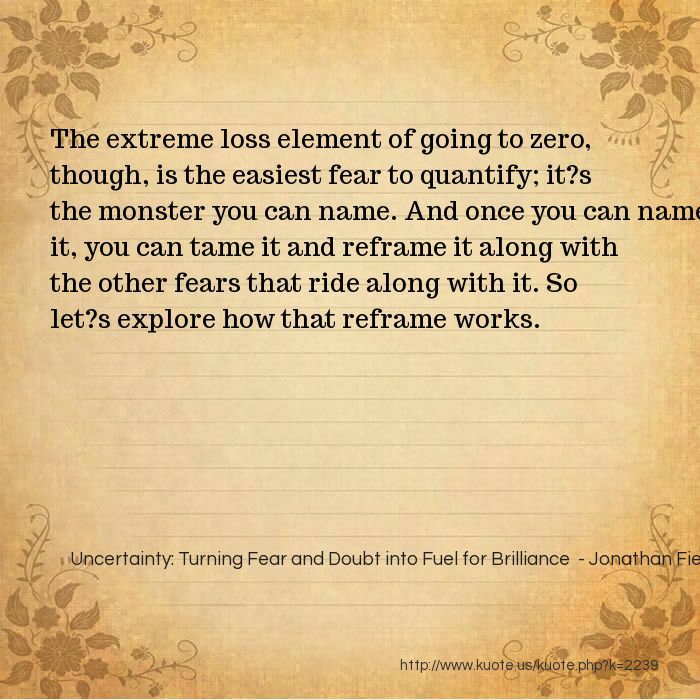 The extreme loss element of going to zero, though, is the easiest fear to quantify; it?s the monster you can name. 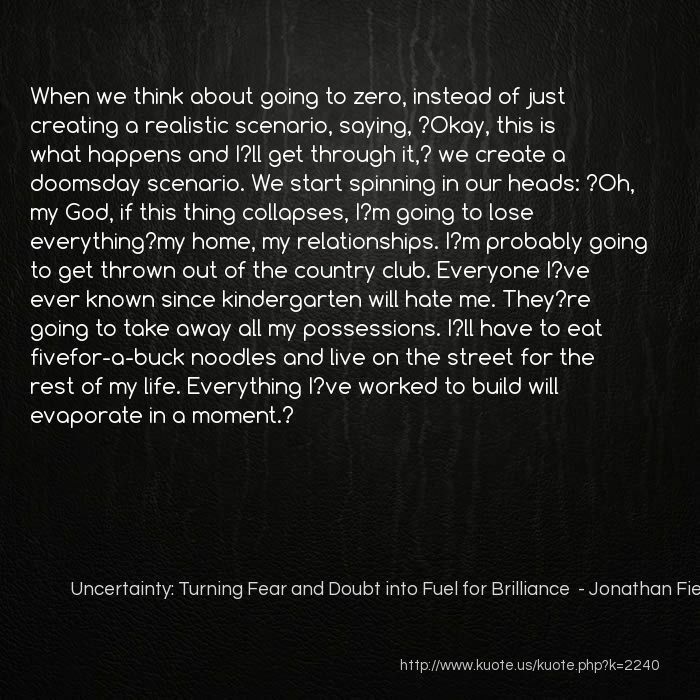 And once you can name it, you can tame it and reframe it along with the other fears that ride along with it. So let?s explore how that reframe works. 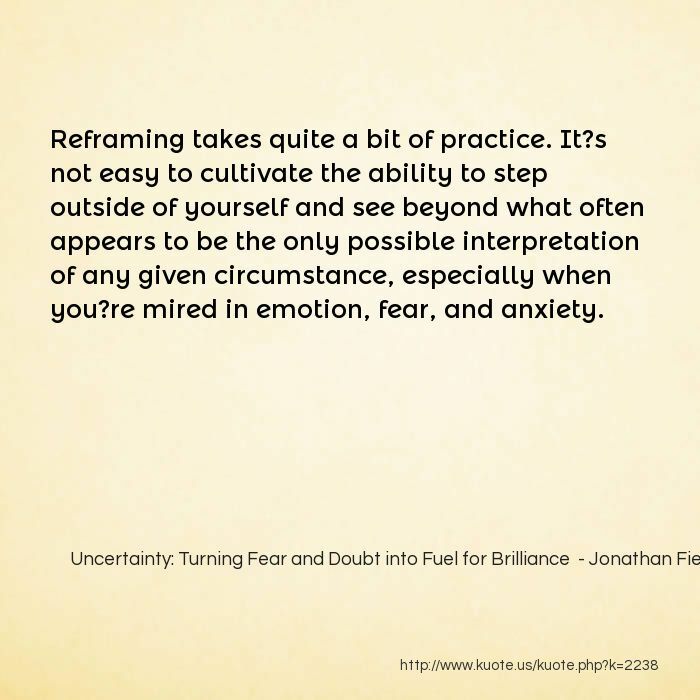 Reframing takes quite a bit of practice. It?s not easy to cultivate the ability to step outside of yourself and see beyond what often appears to be the only possible interpretation of any given circumstance, especially when you?re mired in emotion, fear, and anxiety. 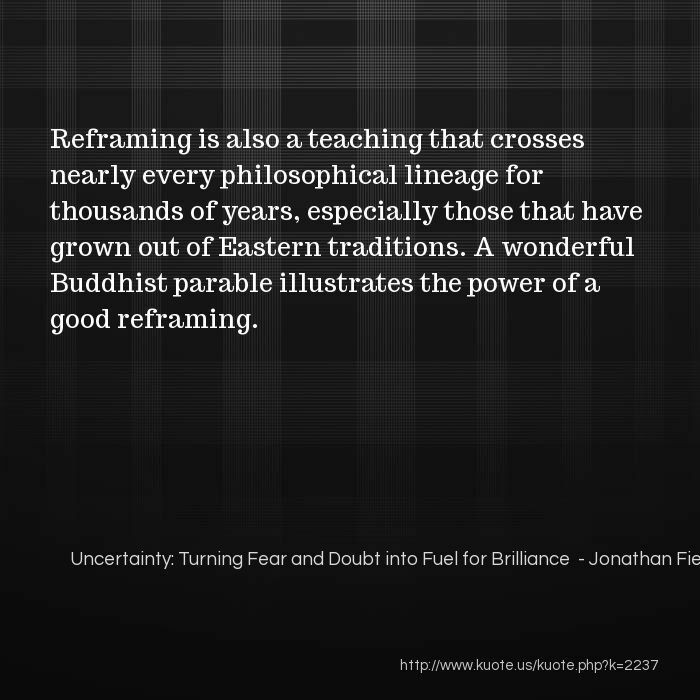 Reframing is also a teaching that crosses nearly every philosophical lineage for thousands of years, especially those that have grown out of Eastern traditions. A wonderful Buddhist parable illustrates the power of a good reframing. 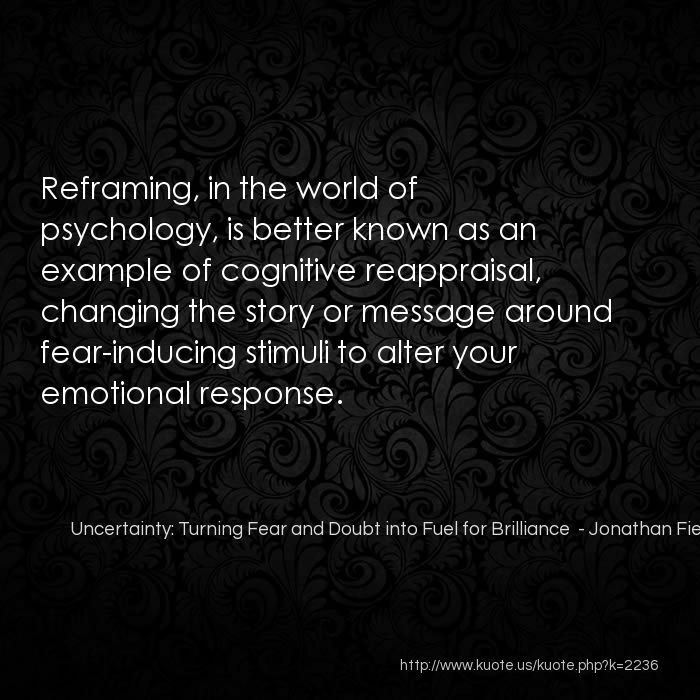 Reframing, in the world of psychology, is better known as an example of cognitive reappraisal, changing the story or message around fear-inducing stimuli to alter your emotional response. These alternative story lines provide fuel to inspire the work she needs to succeed in her current role. 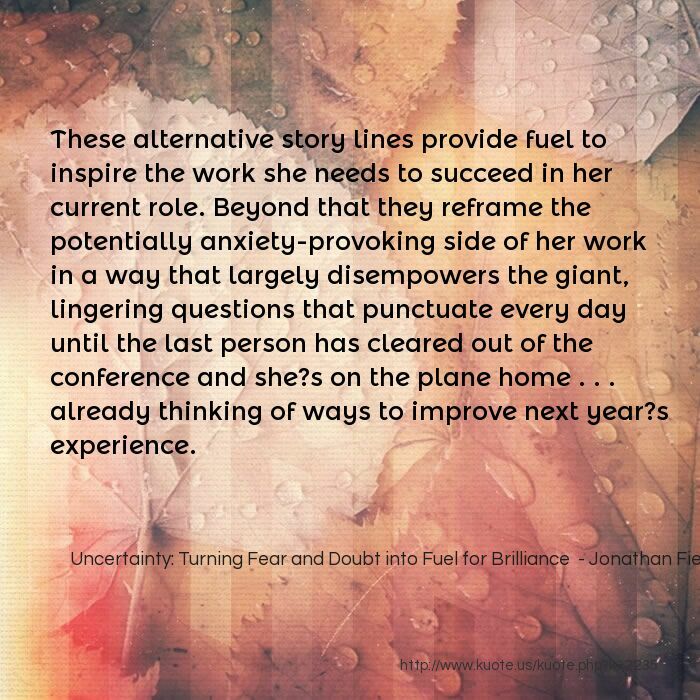 Beyond that they reframe the potentially anxiety-provoking side of her work in a way that largely disempowers the giant, lingering questions that punctuate every day until the last person has cleared out of the conference and she?s on the plane home . . . already thinking of ways to improve next year?s experience. That ?reframe? 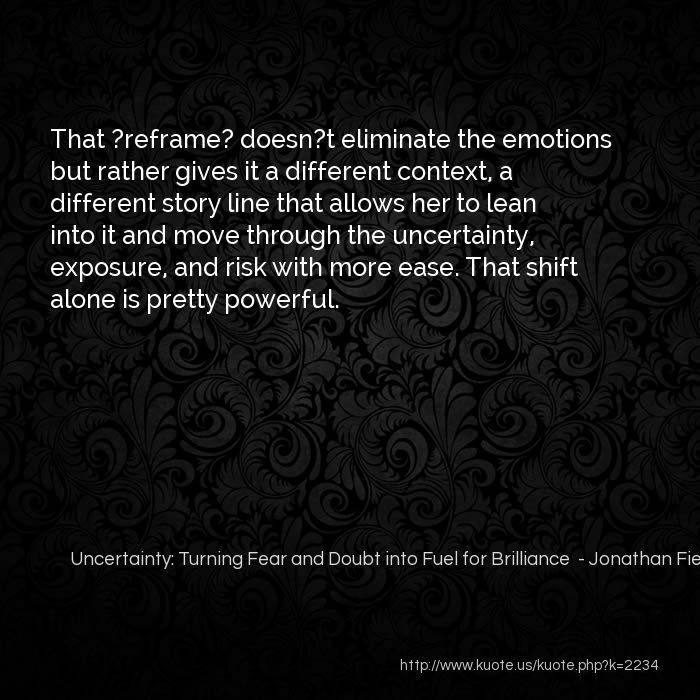 doesn?t eliminate the emotions but rather gives it a different context, a different story line that allows her to lean into it and move through the uncertainty, exposure, and risk with more ease. That shift alone is pretty powerful. 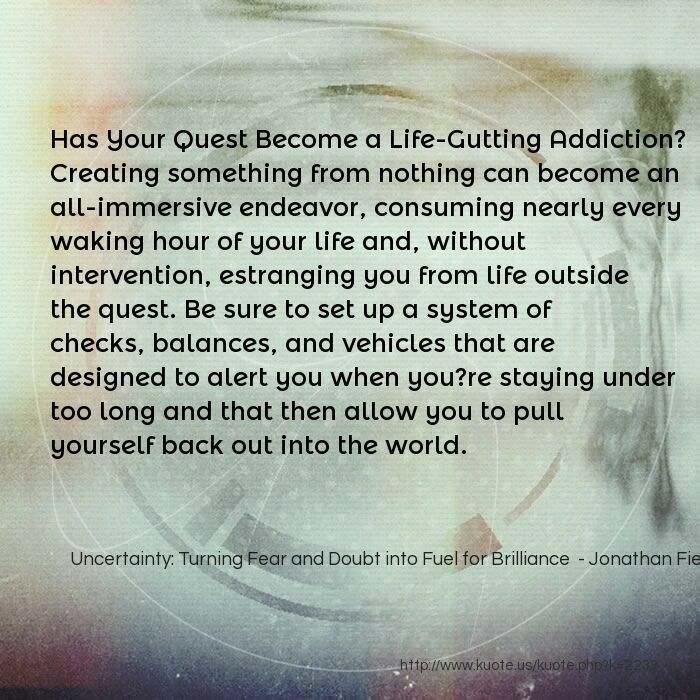 Has Your Quest Become a Life-Gutting Addiction? Creating something from nothing can become an all-immersive endeavor, consuming nearly every waking hour of your life and, without intervention, estranging you from life outside the quest. Be sure to set up a system of checks, balances, and vehicles that are designed to alert you when you?re staying under too long and that then allow you to pull yourself back out into the world.